At last, I am healed! At last, through your skilled hands, I am healed! To be given such a sense of well being and wholeness, after years of suffering is beyond thank you. Gone is the pain. Gone are the crooked toes. Gone are the ugly red bunions. Gone are the boxy shoes and orthopedic sneakers. All gone! Now, I can stand tall on my nice feet, once again. 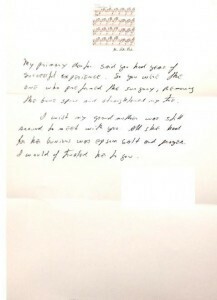 You were not the first surgeon that I spoke with but the one i finally chose. I liked the way you handled my feet, as you examined them with attention, care and concern. I gain confidence as you simply explained what could be done with my feet (end stage arthritis and moderate arthritis and bunion in left big toe joint.) You explained, with confidence, all alternatives without pushing me into a quick decision. My primary doctor said you had years of successful experience. So you were the one who preformed the surgery, removing the bone spurs and straightened my toe. I wish my grand mother was still around to meet with you. All she had for her bunions was epsom salt and prayer. I would of trusted her to you. Thank you for making my left foot pain free and pretty! Your level of skill & care set you apart from the others & I feel fortunate to have found you. I am so happy with the result, I actually look forward to having my right foot done next! 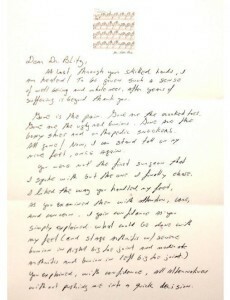 “I would like to commend Dr. Neal M. Blitz, a fantastic surgeon. I was fortunate to locate Dr. Blitz through my online research after receiving two previous medical opinions from surgeons. My research of the Lapidus Arthrodesis [Lapidus Bunionectomy] led me to a couple of articles written by Dr. Blitz. After my first meeting with Dr. 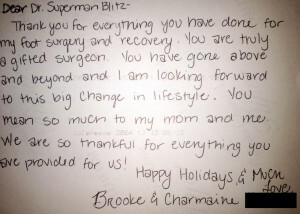 Blitz, I knew I found the right surgeon for me. His knowledge and insight made me feel completely comfortable and at ease. In addition, he really took the time to explain the various procedures to me and he answered all of my questions thoughtfully. I never felt rushed to make a decision or pressured in any way which was refreshing. I honestly felt like he had my best interest at heart.